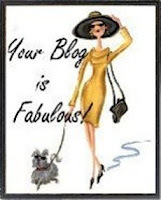 B U B B L E G A R M: MY BLOG ROCKS, BUT YOUR BLOG ROCKS HARDER! 1.When you receive this award, show that you're happy to the giver! 2.Nominate at least 5 blogs, that you think rocks! 4.Now blog like you've never blogged before! Thanks so much! That really means alot!